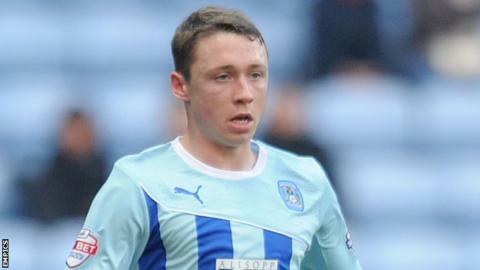 League One promotion hopefuls Walsall have signed young Everton defender Matthew Pennington on loan until the end of the season. The Warrington-born centre-half, 21, who can also play at right-back, returns to League One, having made 25 appearances for Coventry City last season in an extended five-month loan. Walsall need cover as they have an injury concern over James O'Connor. Pennington has made two first-team appearances for Everton this season. Pennington, who has signed a new three-year contract at Everton, played in the early season 5-3 League Cup win at Barnsley and in the 2-0 FA Cup third-round win over Dagenham & Redbridge. He also had another loan spell with Merseyside neighbours Tranmere Rovers in 2013-14. "I know a lot about him," said interim boss Jon Whitney. "It'll be his third loan and we've done a lot of profiling on him. I remember watching him when he played against us for Tranmere. "I've got friends at Everton who know him and he comes really highly recommended. He's always someone who Everton have thought highly of and we've fought off quite a few clubs to get him."